Thanks to Cigar Train and this month's Freight Train package, I finally had the opportunity to smoke the New World Navegante Box-Pressed Robusto From A.J. Fernandez Cigars. Boxed-pressed, dual bands, a dark Maduro colored wrapper, all of these make one good looking cigar. This Nicaraguan wrapper conceals a blend of ligeros from Esteli, Condega and Ometepe. After punching the triple cap, the draw is free with flavor notes that are both sweet and spicy. The cold flavor mix reminds me a little of spiced peaches. 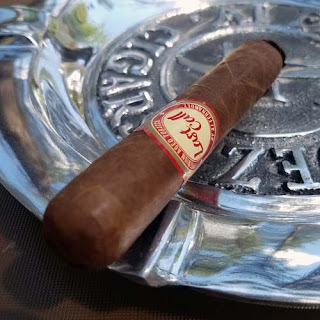 Once the cigar is toasted and burning there are several blasts of bold, full bodied red pepper right up front. Quickly the hot pepper yields to more of a medium bodied mix that tastes like cream and cocoa. Caramel, toast, oak, brown sugar and a hint of tree fruit take the sharp burn line to the mid point. Right at the mid point the flavor mix is dominated by chocolate with toasted almonds, earth, and hints of charcoal. Testing the retro hale, it was surprisingly mild with nuances of smooth, fruity oak. After fifty-five minutes the full/medium bodied Navegante finishes with flavors of charred espresso, cocoa and some light black pepper. Overall the New World Navegante Box-Pressed Robusto From A.J. Fernandez Cigars was a joy to smoke. It produced large volumes of smooth, creamy smoke with a slightly dry red wine type finish, it has great construction and a good looking overall appearance. In my opinion A.J. Fernandez creates another winner!